Simple! Unique! Versatile! Advanced! Highly Effective! These are the comments that best describe SwingPerfect, the gyroscopic swing trainer that uses vibration feedback to allow you to develop the perfect swing. The concept of SwingPerfect is quite simple. 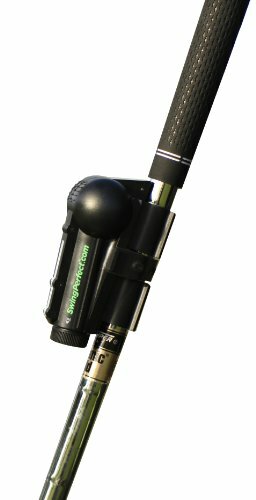 You simply attach SwingPerfect to your own golf clubs (works with all clubs except your putter), align it with your club head and you receive vibration feedback through the club handle when your swing deviates from the proper swing plane. The unique application of SwingPerfect is that it works with your own clubs during real time practice on the range or while playing, delivering maximum muscle memory development and immediate correction. SwingPerfect is amazingly versatile by allowing you to use all the clubs in your bag and develop the intricacies of your swing with each club. SwingPerfect is certainly advanced with development that took years to perfect and backed by 5 U.S. Patents. SwingPerfect is highly effective, analyzing all 5 swing aspects including swing plane angle, club face rotation, vertical axis, horizontal axis and tempo & direction. SwingPerfect is made of high strength molded plastic, weighs only 2.3 ounces, is powered by a 1.5 volt battery (included - replacement batteries available at any general merchandise/grocery/drug-type store), includes 2 rubber safety straps and an Instructional DVD.